With the weather slowly getting warmer, we’re craving lighter, healthier options here at Season’s Eatings that still retain vibrant flavour. Our Vietnamese inspired salad is just that: bursting with fresh vegetables, a ginger zing and the delicate coriander flavour, this is the perfect for a summer al fresco lunch. For the chicken, we just gently cooked 3 medium-sized breasts in the oven and left them to cool slightly before tearing the meat up and adding to the salad, although if you don’t want the hassle of that (not that it is much) use a 200g pack of pre-cooked British cooked chicken pieces. You can add beansprouts too, but we didn’t include any here as didn’t have any to hand – they just need heating for 2-3 minutes then draining under ice-cold water before being added to the salad. The recipe serves 4, and leftovers can be kept in the fridge overnight in a sealable container. Meanwhile prepare the vegetables: peel and grate the carrot; finely slice the salad onions, chop the cucumber and peppers into 6cm Julienne (matchstick) style batons; peel and finely chop the ginger into batons as fine as possible; chop the coriander. 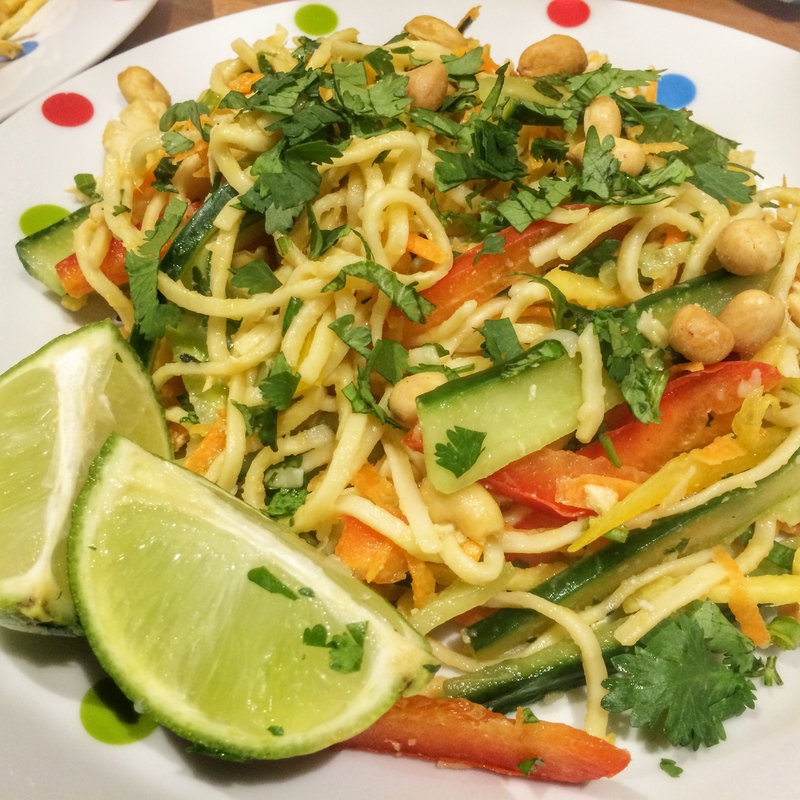 Add all the vegetables to a large bowl with the cooked noodles, chicken, peanuts, beansprouts if using, and most of the coriander (reserve a small amount as garnish). Separately, mix together the sesame and sunflower oils, lime juice, sweet chilli sauce and soy sauce. Dress the salad and then toss until evenly coated. Serve each portion with a couple of wedges of lime and a sprinkling of the leftover coriander.